Though odorless in its normal state, utility companies add sulfur-containing odorants - called mercaptans or thiols - to the gas so it's easy to detect a leak. The foul smell is reminiscent of rotting cabbage or spoiled eggs. In a new study, co-authored by University at Albany distinguished professor of chemistry Eric Block, researchers have not only determined which of our olfactory receptors (ORs) is responsible for this nasty smell, but also the effects metals such as copper have on our sensitivity to the stench. "Obviously it is essential for everyone to be able to detect gas leaks by recognizing the smell of the sulfur odorant," Block said. "Unfortunately, some people have a diminished sense of smell, or the absence of smell all together. Understanding how we smell sulfur could help doctors treat those who are not responsive it." The research team identified OR2T11 as the receptor that responds most strongly to natural gas odorants. More importantly, they discovered the presence of copper and/or silver amplifies our sensitivity by one hundred to one thousand fold. In fact, without the metals, OR2T11 only weakly responds to the gas odorants. Their results were recently published in the Journal of the American Chemical Society. Collaborating with Block were neuroscientists Hanyi Zhuang (Shanghai Institutes for Biological Sciences) and Hiroaki Matsumoto (Duke University), computational chemist Victor Batista (Yale University), spectroscopist Jessica Burger (the National Institute of Standards and Technology), and their respective colleagues. "Our collaborative research shows nature has developed a way to make sure we have maximum possible sensitivity to sulfur, since often the presence of sulfur compounds signals a hazard," Block said. "The metal effect makes sense, as metal has a strong attraction to sulfur, for example silverware rapidly turns dark when eggs are cooked. However, there was very limited evidence for the role of metals in olfaction prior to our work." 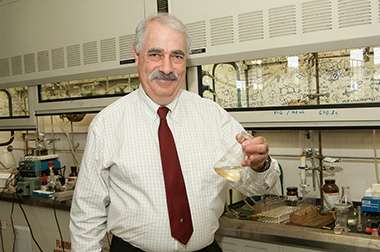 A renowned organosulfur chemist, Block has spent the majority of his 50-year career studying sulfur compounds. His latest research connecting smells with individual olfactory receptors began several years ago. Humans have more than 350 unique receptors, with which an almost infinite number of odors and odor mixtures can be identified. Ultimately, Block and his team hope their findings can help scientists develop an artificial nose that can detect sulfur compounds from various sources. "A receptor is considered to be an 'orphan' until paired with the odorants it is most responsive to," Block said. "The process of 'deorphanizing' all of our human receptors is difficult and time consuming. It has only been possible in recent years with the development of specialized techniques in molecular biology. My colleagues and I are working at the frontier of this field."